Acts 4:29-31 “Now, Lord, consider their threats and enable your servants to speak your word with great boldness. Stretch out your hand to heal and perform signs and wonders through the name of your holy servant Jesus.” After they prayed, the place where they were meeting was shaken. They were all filled with the Holy Spirit and spoke the word of God boldly. 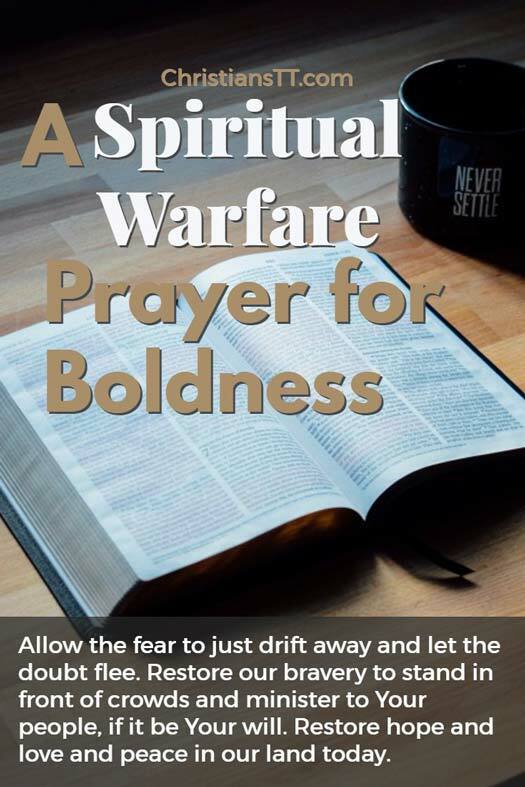 The Bible shows us that we can pray for boldness. And, we should! Paul asked the church at Ephesus to pray for him for boldness. This great man of God, said, “Praying always . . . for all saints; And for me, that utterance may be given unto me, that I may open my mouth BOLDLY, to make known the mystery of the gospel, For which I am an ambassador in bonds: that therein I may speak BOLDLY, as I ought to speak” (Eph. 6:18–20). And so, let us pray together. Today, Oh loving Father, I will step out in faith and not fear. I will boldly profess the victory in my life. I will not let shyness get the better of me. Break every chain, Oh Lord, that hinders my confidence, in not only myself but also in You, the Everlasting Father. Ephesians 6:19 Pray also for me, that whenever I speak, words may be given to me so that I will fearlessly make known the mystery of the gospel. Today, I proclaim with boldness that I am healed and set free by You, my faithful King. I know I can depend on You, for You always stand by Your word. Help me to build my confidence as I draw near to You. Teach me to spread Your message boldly across the land and to confess that Jesus Christ is Lord. Allow the fear to just drift away and let the doubt flee. Restore my bravery to stand in front of crowds and minister to Your people, if it be Your will. Restore hope and love and peace in my land today. In Jesus’ loving name, I pray that the boldness that I long to have will arise. Amen and Amen.